Again, we accommodate the different tastes by creating variety of colors to our products. 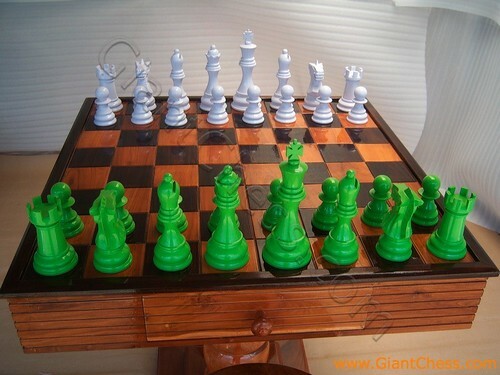 The new attractive colors of our chess piece are green and white add fresh touch in your house. The colors promote modern and elegant look. Combined by the brown chess table, it is perfect to be placed in your house. The green will bring its fresh influence and the white bring its everlasting touch. Have it now to make your house feels different and fresh. As chess manufacturer, we provide variety kind of chess in different sizes and colors. Now on, we introduce to you about the green chess set with glossy touch againts the bright red. Children like this kind of chess. You may give them for learn much of chess and support them with colors chess. Those chess pieces, chess table and stool are carved by our professional craftsman and made from best quality of Teak wood. The products are made of durable natural material and clear acrylic lacquer.